NOTE: New papers are now being added to The Pub Club Scoop.it page. Inspired by the papers Sheng Yang emails us every week. If you see a new paper you would like to share, please post on The Whiteboard. Pseudoperonospora cubensis is an obligate pathogen and causative agent of cucurbit downy mildew. To help advance our understanding of the pathogenicity of P. cubensis, we used RNA-Seq to improve the quality of its reference genome sequence. We also characterized the RNA-Seq dataset to inventory transcript isoforms and infer alternative splicing during different stages of its development. Almost half of the original gene annotations were improved and nearly 4,000 previously unannotated genes were identified. We also demonstrated that approximately 24% of the expressed genome and nearly 55% of the intron-containing genes from P. cubensis had evidence for alternative splicing. Our analyses revealed that intron retention is the predominant alternative splicing type in P. cubensis, with alternative 5′- and alternative 3′-splice sites occurring at lower frequencies. Representatives of the newly identified genes and predicted alternatively spliced transcripts were experimentally validated. The results presented herein highlight the utility of RNA-Seq for improving draft genome annotations and, through this approach, we demonstrate that alternative splicing occurs more frequently than previously predicted. In total, the current study provides evidence that alternative splicing plays a key role in transcriptome regulation and proteome diversification in plant-pathogenic oomycetes. Changes in pH are now widely accepted as a signalling mechanism in cells. In plants, proton pumps in the plasma membrane and tonoplast play a key role in regulation of intracellular pH homeostasis and maintenance of transmembrane proton gradients. Proton transport in response to external stimuli can be expected to be finely regulated spatially and temporally. With the ambition to follow such changes live, a new genetically encoded sensor, pHusion, has been developed. pHusion is especially designed for apoplastic pH measurements. It was constitutively expressed in Arabidopsis and targeted for expression in either the cytosol or the apoplast including intracellular compartments. pHusion consists of the tandem concatenation of enhanced green fluorescent protein (EGFP) and monomeric red fluorescent protein (mRFP1), and works as a ratiometric pH sensor. Live microscopy at high spatial and temporal resolution is highly dependent on appropriate immobilization of the specimen for microscopy. Medical adhesive often used in such experiments destroys cell viability in roots. 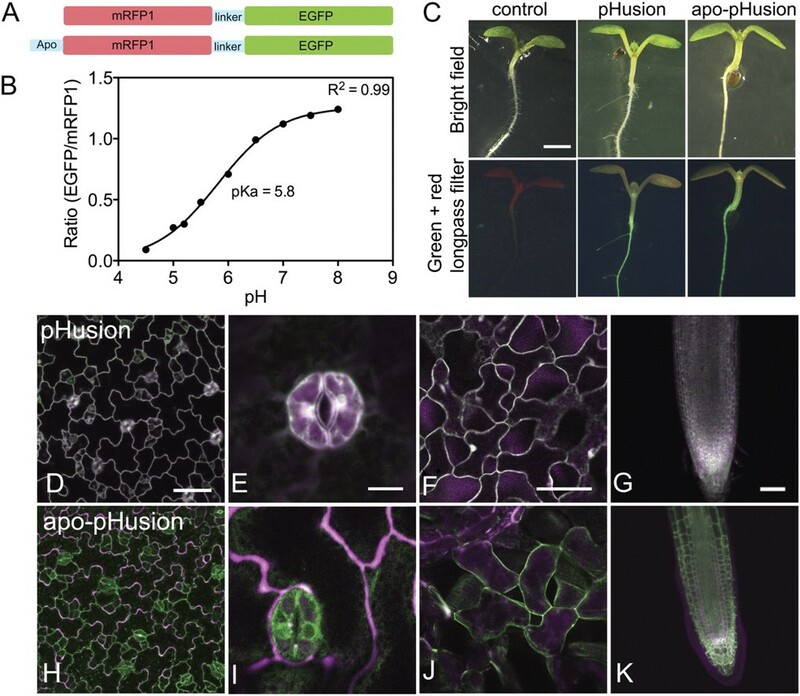 Here a novel system for immobilizing Arabidopsis seedling roots for perfusion experiments is presented which does not impair cell viability. 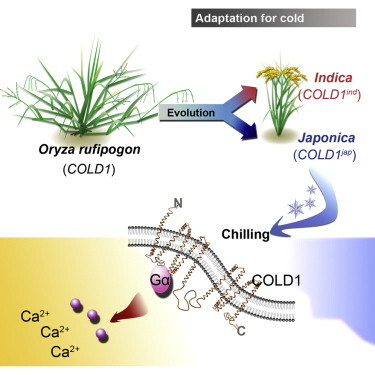 With appropriate immobilization, it was possible to follow changes of the apoplastic and cytosolic pH in mesophyll and root tissue. Rapid pH homeostasis upon external pH changes was reflected by negligible cytosolic pH fluctuations, while the apoplastic pH changed drastically. The great potential for analysing pH regulation in a whole-tissue, physiological context is demonstrated by the immediate alkalinization of the subepidermal apoplast upon external indole-3-acetic acid administration. This change is highly significant in the elongation zone compared with the root hair zone and control roots. Increase in demand for our primary foodstuffs is outstripping increase in yields, an expanding gap that indicates large potential food shortages by mid-century. This comes at a time when yield improvements are slowing or stagnating as the approaches of the Green Revolution reach their biological limits. Photosynthesis, which has been improved little in crops and falls far short of its biological limit, emerges as the key remaining route to increase the genetic yield potential of our major crops. 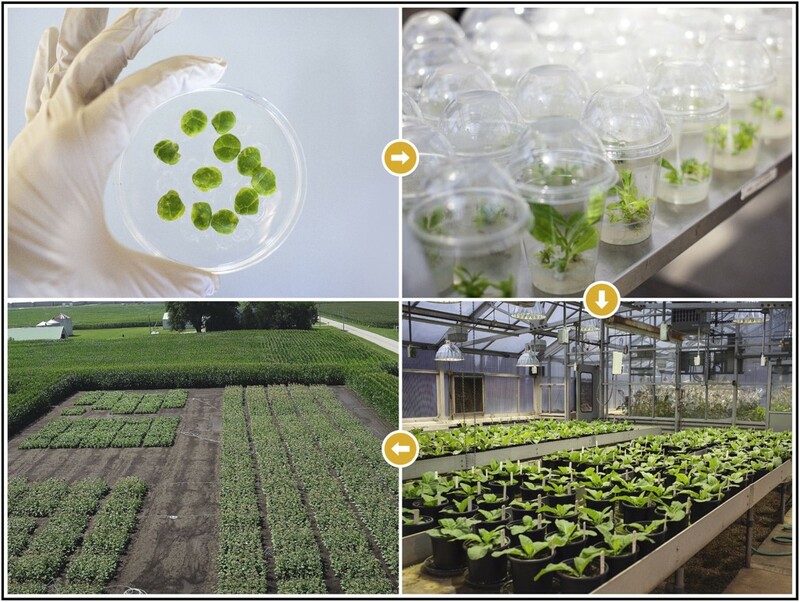 Thus, there is a timely need to accelerate our understanding of the photosynthetic process in crops to allow informed and guided improvements via in-silico-assisted genetic engineering. Potential and emerging approaches to improving crop photosynthetic efficiency are discussed, and the new tools needed to realize these changes are presented.